Okay, first thing first. Some of you might be a bit confused with the last part of the text. Basically, the Magic/Trap card that you set down (if you do) after activating Dust Tornado, can only be activated at the same turn IF it was a Quickplay Magic. This is so that you don't think you could set Mirror Force down and activate it. This is similar to Mystical Space Typhoon with a few differences. First of all, you can't activate it during the turn that you draw it so, in a sense, it's slow. Speed is probably the most decisive factor between this and MST and a lot of people will definitely take MST over Dust Tornado. BUT, there is one time Dust Tornado is SUPERIOR to MST. When your opponent gets Imperial Order out, you might not have a MST handy to destroy it. Even if you draw it, MST is still a dead card while Imperial Order is out. On the other hand, Dust Tornado can destroy Imperial Order anytime. Now your question is, should I play Dust Tornado over MST? Most probably not. Though Dust Tornado is better against Imperial Order than MST, that's only one card. MST is almost always better than it. it is a Quick-Play Magic Card. difference. 1 opponent turn can make a difference between a win and a loss. Also, the ability to also destroy your own Magic or Trap card can be vital. Magic or Trap that is hurting you. Conclusion: If they only called MST tornado. Today we look at Dust Tornado. This card is the trap version of mystical space typhoon. It lets you destroy 1 m/t card on the field and then lets you set a m/t card from your hand. But the card you set down cannot be used right away unless it is a quick play magic card. As with most single m/t destruction cards, you should almost never use this on a face down m/t card unless you know what it is since most likely, it will be a trap card than can be chained to this card (like Waboku), making Dust Tornado useless. I suggest using it only on face up magic and trap cards such as gravity bind, ground collapse, solemn wishes... As for the overall I would much rather go with the MST since that can be played right away whereas this card must be set for a turn first. That 1 turn could cost you the game, especially if you need to attack that turn and there is a gravity bind active. the bandit in the current metagame. What to say about this card besides the fact that is not that great and I can't think of a single reason of why you waould want to play it? Maybe if a lot of players started using cards like Charge Reclesly and such but even then I still wouldn't use this card or even think about adding it to my deck. 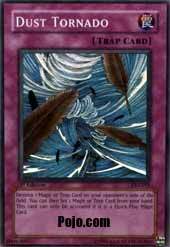 I rather use Mystical Space Typjoon and be able to destroy just bout any Magic and Trap card my opponent can play. Destroy 1 Magic or Trap on your opponent's side of the field. You can then Set 1 Magic or Trap Card from your hand. This card can only be activated if it is a Quick-Play Magic Card. Dust tornado is simply lots of fun. The effect is something your opponent will hate. Today's Cotd is the ever so interesting Dust Tornado. The effect from Dust Tornado is similar to that of Mystical Space Typhoon, but with the added bonus of allowing you to set a Magic card from your hand. This isn't that great, because you could just set a quick play magic on your own turn. There are situations where this can be handy, like if your opponent uses a Harpy's Feather duster (this will come out later though). But for now, Dust Tornado is just inferior to a Typhoon. And on a different note, all you DFW Texas metroplex players, come to JJK-cards in the Six Flags mall thursday nights, and to The Festival mall Sundays at noon for weekly tournaments to come and play Yu-gi-oh! and hang out with Pojo's Martin. Email MartinReturns@aol.com for more info. SomeGuy Bleh. Thanks to the few people that emailed me about my mis-ruling on Solemn Wishes. It's not a card that I use often and I didn't have the time to check rulings. Regardless, it's still a fairly decent card. Anyway... Back to the CotD. Destroy 1 Magic or Trap on your opponent’s side of the field. You can then Set 1 Magic or Trap Card from your hand. This card can only be activated if it is a Quick-Play Magic Card. For those beatdown decks that only run two Heavy Storm maindeck, this along with Mystical Space Typhoon work great in the Side Deck. When you're against Gravity Bind/Messenger of Peace control decks that play maindeck Prohibition, this can be a game two winner. Usually the first Prohibition your opponent plays will prevent Heavy Storm while the 2nd will prevent Mystical Space Typhoon, or vice versa (This way they can get the lock/control set up). They will never suspect Dust Tornado (Or even De-Spell for that matter...). besides running one or two in your sidedeck, Mystical Space Typhoon will almost always be the better card to maindeck. Unless you don't own any. On the bright side, Dust Tornado can chain to Imperial Order just as Mystical Space Typhoon can. About Dust Tornado's added effect, it's a little pointless if you ask me. It does have some upsides, but nothing that is game breaking.